David Weekley Homes, the largest privately-held builder in the nation, is offering an impressive array of elegant, quality-crafted home designs at Shearwater, the new master-planned community in St. Johns County. The Cloverwood model is just one of many beautiful new home designs from David Weekley, perfectly suited to the Shearwater lifestyle. Starting in the low-300,000s, the Cloverwood plan offers approximately 2,477—2,511 square feet of living space in a single-story design with up to five bedrooms, three full baths and a two-car garage. The gracious front porch makes it easy to connect with neighbors, while the stately owner’s retreat—complete with a luxurious bath and walk-in closet—provides a private oasis. The formal dining room is perfectly complemented by a spacious kitchen with expansive cabinetry and large center island, giving this home everything you’ll need to entertain large groups or small family gatherings. 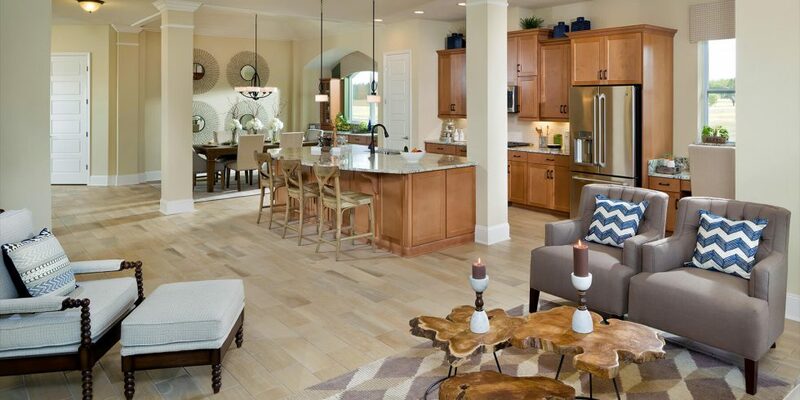 David Weekley Homes is offering their unique collection of Imagination and Designer series homes at Shearwater. Floor plans range in size from approximately 1,637—2,862 square feet, two to five bedrooms, and two to four bathrooms in both one- and two-story designs. Buyers have the opportunity to personalize their homes with endless details that will make each home perfect for every resident’s lifestyle. David Weekley Homes also offers FlexSpaceSM in their floor plans, allowing your home to grow and change according to your family’s needs. The FlexSpaceSM addition could be a study, playroom, movie room or anything else that your family’s lifestyle might necessitate. If you’d like more information on the Cloverwood floor plan, or any of the homes being offered by David Weekley Homes at Shearwater, come tour the models and experience the homes for yourself. David Weekley Homes’ models are open Monday through Saturday from 10:00am-6:00pm and Sundays from noon-6:00pm.